Seems I’ve been so distracted going on and on about the waning summer months that I almost forgot about one of the absolute best things about the end of summer… the bounty that comes from my teeny tiny little garden. Sure, there are hardships that come along with all of this produce. For instance, I swear I would never even look at a zucchini again if it weren’t for a certain recipe that I will share with you in the next few days. (Trust me, it’s worth the wait.) And, as much as I love tomatoes, there is only so much salsa, tomato sauce, and tomato sandwiches that one small family of two people and pooch can consume. It’s a rough life, guys. 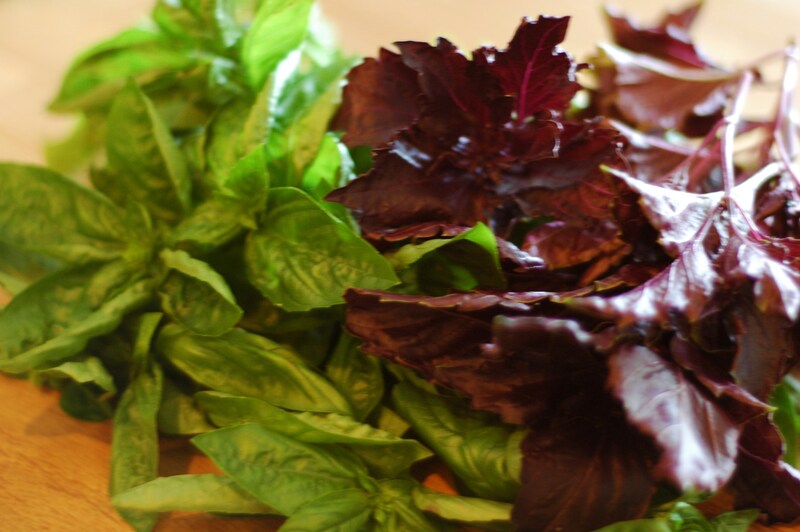 But the one thing that I can never get enough of from my garden is basil. 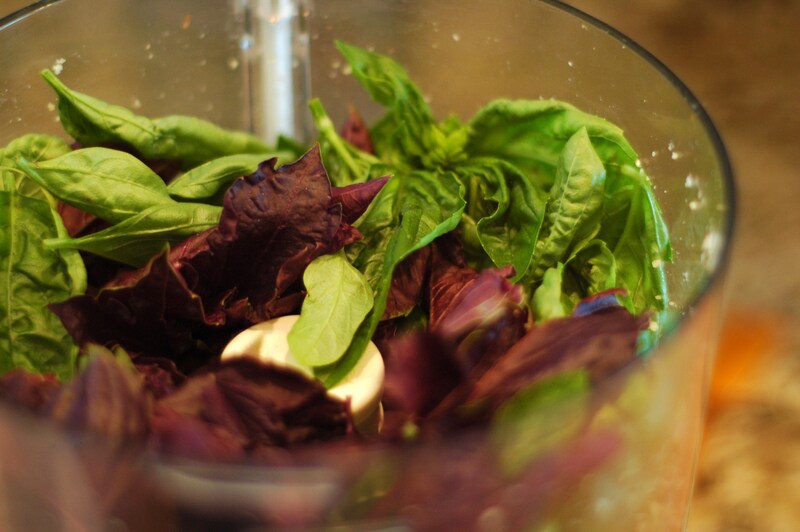 Sure, it helps with all those tomatoes- you know, for the marinara sauce, the caprese salad- but in my mind, the real purpose of growing tons of basil lies in one magnificent little word: PESTO. Say what you will about how pesto is sooo nineties and how people call anything blended with cheese and oil pesto these days and blah blah blah. I can’t even hear you because I’m too busy thinking about how delicious fresh, homemade basil pesto is. In my mind, it’s one of the best things ever. And I will tell you why. In list form. 1. It’s just plain delicious. 2. A little bit goes a long way. A big batch, divided into small containers, could last you several months. 3. Oh, well, like I kind of said in #2, it freezes well. So you can get a little taste of summer in the middle of the winter. 4. It’s cheap. Especially if you grow your own basil (or even if you don’t) and if you don’t use those crazy ridiculous pine nuts that are oh-so-delicious, but also oh-so-expensive. 5. It’s versatile. You can obviously use it as a pasta sauce, but beyond that, the possibilities are endless. Use some in a marinade or salad dressing, use it to top crostini as an appetizer, mix a little bit with mayo to put on your sandwich….see what I’m saying? 6. Pesto is super easy to make in a food processor. You pretty much toss everything in and give it a whirl. Are you convinced yet? Well, I’ve done my best. This recipe for pesto might not be the absolute best or most authentic, but it’s what I’ve come up with after lots of trial and error. This recipe is about as simple as it gets, which for me, is pretty much the point of pesto. I use walnuts instead of pine nuts, partly because it’s cheaper, and partly because it results in a lighter pesto, with a cleaner basil and garlic flavor. 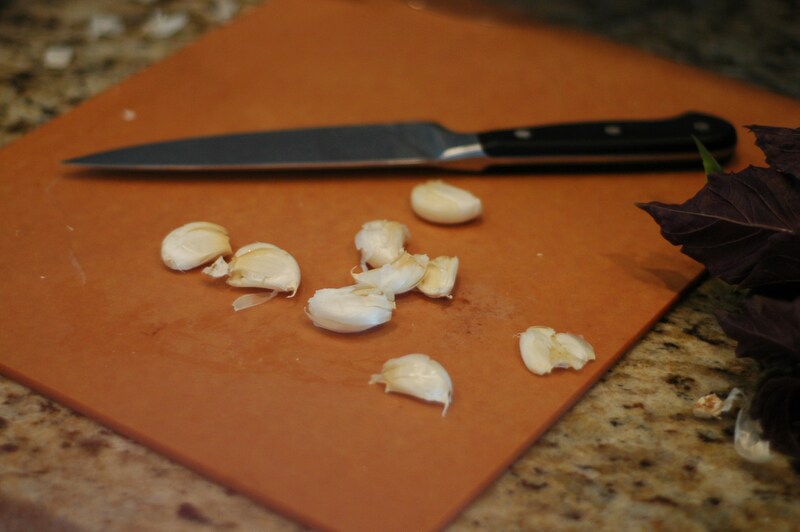 Don’t get me wrong, if you have pine nuts, go ahead and use them. Either way is delicious. Also, a note about my basil. You may have noticed that my pesto is not an intensely bright green. That’s because I used half regular old basil and half Purple Ruffle basil. Purple basil has a more intense liquorice flavor than regular basil, so I thought it might be nice to have a balance of the two. I thought that it might make the color of the finished product a little, um… muddy, but I continued anyway. And I figured the taste matters more than the color, right? Well, I still suppose that’s true, but I underestimated how much I cared about brilliantly green pesto. I really do care. Call me shallow. Next time, I’ll either make it with all green or all purple basil. However, if you are less shallow about pesto color than I am, I’d encourage mixing, since the flavor was awesome- a perfect balance of spicy liquorice flavor and sweet, fresh herb flavor. 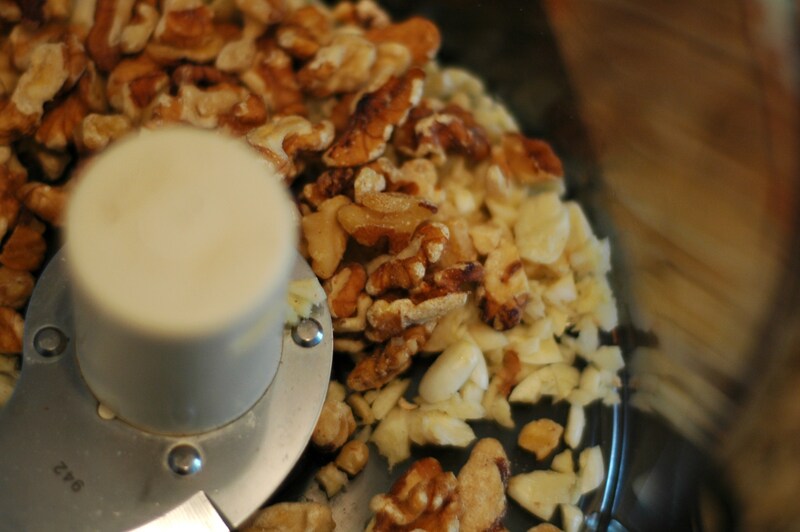 Put the nuts and garlic in the food processor and process for about 20-30 seconds. Add in the basil, along with the salt and pepper. Start the food processor and while it is running, slowly pour in the olive oil through the feed tube. Process until the pesto is smooth. Add the cheese and puree for another minute. At this point, you can use the pesto for whatever you like, or store it. If you’re going to put it in the fridge or freezer, put the pesto in the a container, then cover it with a little bit of olive oil. Just made this and it is terrific!!!! The taste is fresh and satisfying! 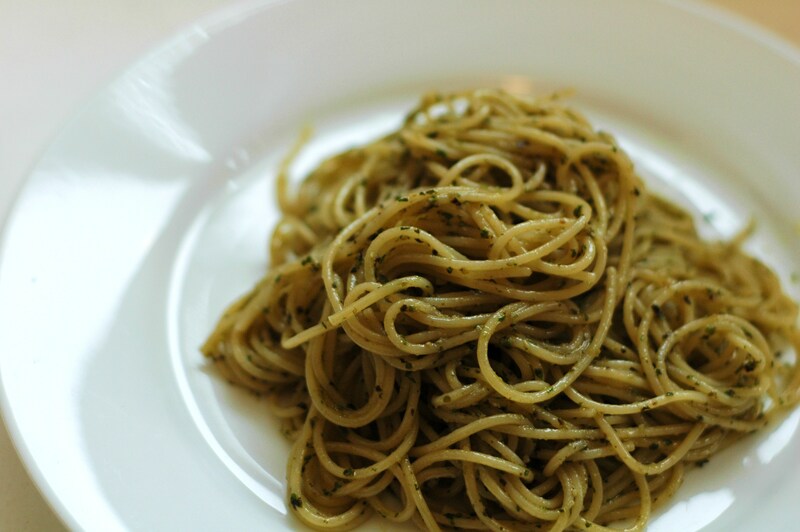 This will be my go-to recipe for pesto from now on! Thanks!